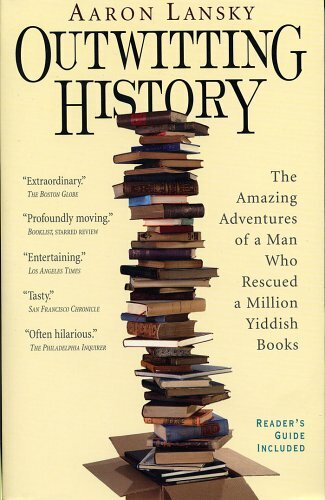 In 1980, a twenty-three-year-old graduate student named Aaron Lansky set out to rescue the world’s abandoned Yiddish books before it was too late. Twenty-five years and one and a half million books later, he’s still in the midst of a great adventure. Filled with poignant and often laugh-out-loud tales from Lansky’s travels across the country col­lecting books from older Jewish immigrants, Outwitting History also introduces us to a dazzling array of writers and shows us how an almost-lost culture is the bridge between the old world and the future. Aaron Lansky is the founder and president of the National Yiddish Book Center (www.yiddishbookcenter.org) in Amherst, Massachusetts. The re­cipient of a MacArthur “genius” fellowship, Lansky has helped fuel a renaissance of Jewish literature in this country. He lives with his family in western Massachusetts. The humorous scene that follows lunch at the Garden Cafeteria high­lights the central theme of difference and similarity developed throughout the book. How does difference yield to common cause at the physical level and the emotional level in this vignette?
. Characters in this story are dressed in particular and significant ways. How do the clothes help us to understand people, priorities, and cul­tures in Outwitting History? What do books mean to Lansky and to the people who donate them? Why did books take on such special importance for Jewish immigrants in America? Do books bear meaning in your family or cultural history? Why did so many older Jews consider their Yiddish books their yerushe or “inheritance”? How is this concept of inheritance different from or similar to your own? The differences of the Hebrew and Aramaic books and that of the Yid­dish books are those of classical and popular culture, of high and low art. How do those distinctions play out in the book? How do other dis­tinctions between high and low culture affect your life? Discuss some of the ways the next generation considered themselves to be “unlike” their immigrant grandparents. Is it unusual to find chil­dren more interested in the generation of their grandparents than that of their parents? Lansky describes the National Yiddish Book Center as a “home” for Yiddish books. Why did these books need a “home”? What motivated Lansky’s choice of Amherst, Massachusetts for the National Yiddish Book Center? What opposition to a National Yiddish Book Center did Lansky encounter and have to overcome? What were the political and fiscal realities with which he grappled? What does Lansky mean when he describes the Canadian immigration experience as a “mosaic” rather than a melting pot? How did American Jewish culture and Canadian Jewish culture develop differently? Who is your favorite hero or what is your favorite vignette from the book? How does this personal story fit into the larger historical context? In the end, do you think Yiddish “outwits” history? Why or why not?